Spring break is underway, and I’m heading back to Wisconsin for a visit. Apparently it’s in the 20’s there right now, though, so I’m bringing all my best cold weather food ideas. 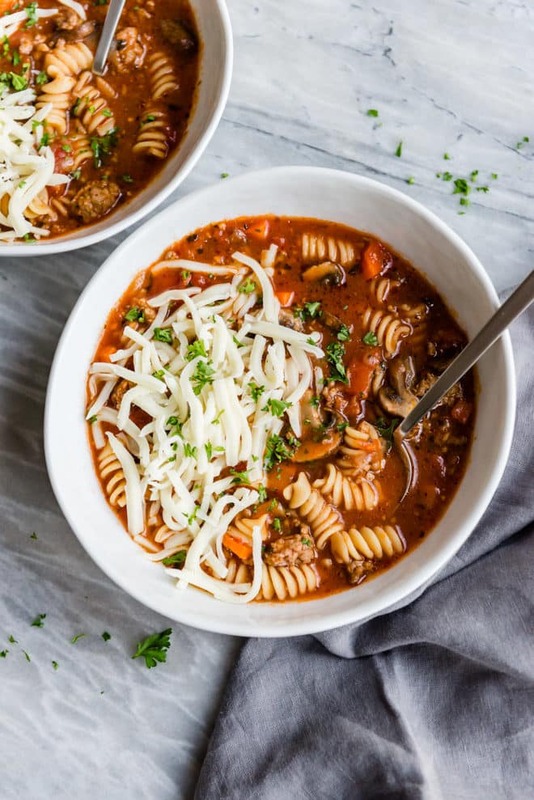 Lasagna Soup is perfect for the occasion because it’s so easy to make and tastes delicious! Everyone is going to love it. What meat goes in Lasagna Soup? I started with a pound of Italian sausage. Brown the meat in a skillet with the vegetables before you add it to the slow cooker. You can drain the grease if you want to (I never do because Fat is Flavor). 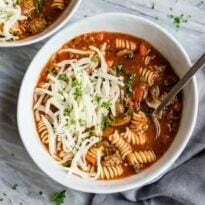 While browning the meat and softening the vegetables in a skillet, load up your slow cooker with the canned tomatoes, tomato sauce, mushrooms (OPTIONAL), and a pile of spices. I LOVE these spices; they are straight from my favorite lasagna recipe. Stir in some water. Add the meat mixture. Cook slowly. Towards the end, stir in some noodles. I think radiatori pasta is adorable and apparently everyone else thinks so too, since I couldn’t find it ANYWHERE. I used rotini. The best part about this, and the part that really makes it feel like lasagna, is when you ladle up a huge bowl full and then SMOTHER it in cheese. We’re talking about lots of cheese here. Because it’s a lasagna which I think means MOSTLY CHEESE in Italian. To my sister Monica and anyone else who hates ricotta cheese: You’re welcome. And to anyone out there who shall remain nameless that gets freaked out by the gigantic lasagna noodles: You are also welcome. 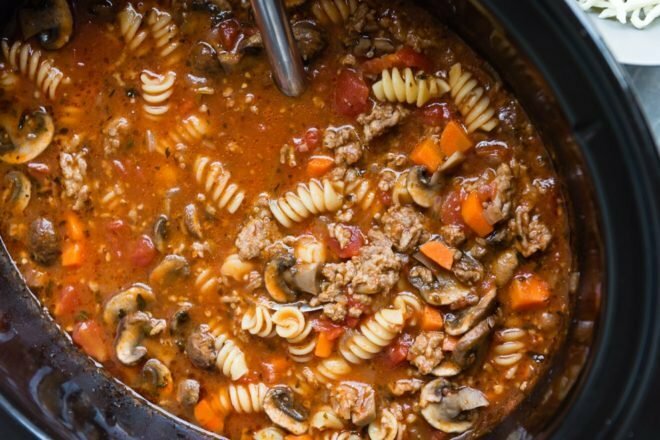 Save this Slow Cooker Lasagna Soup to your “Slow Cooker” Pinterest board! Adapted from Calico Capers "Go To" Cookbook. Love your blog and all your recipes. A new chain restaurant call “be good” has opened and my daughter is raving about the quinoa and kale bowls with ginger and almond. Do you have any recipes for this? kale, sautéed veggies, bok choy, tamari almonds, red cabbage, enoki mushrooms, mint, toasted almond-ginger sauce” from a restaurant called B.Good. Sadly, I think it’s only in the New England and I’ve never eaten there! I could certainly make something using the ingredients they have listed, but without trying it myself I could never claim it was a “copycat.” So sorry about that! Thanks again for visiting my site! Ok so yes havsies IS a word :) And I do NOT think you will be jealous when I am freezing my bum off in Chicago and you are basking in the LA sun :) This looks soo yummy! I am totally looking forward to making a vegan version of this!!! I love soups!!! LOVE!!! Thanks, Mila! This would totally translate to vegan, so easily. And it would be SO good!!!! Oh, Meggan …. great minds or what?! I just posted an easy lasagna recipe too! This idea of yours is amazing. I love the flavours of lasagna but really can’t be bothered to go to the trouble of making it very often. Love this dump in the slow cooker and wait version so much more. And I’ve been looking for more slow cooker ideas, too … bonus! Ha ha Helen, there is definitely no disputing that we are both great minds! Or at least you are! This was so much easier, plus no baking in the oven and it was 100 degrees here today so… yeah. Slow cookers are just as useful in the summer as the winter! This so much better than faffing (a British word for messing) around with lasagna, that’s why I don’t make it. But being the soup nut that I am, I will be making this. You are seriously THE soup nut. Why bother with layering noodles when you can just dump it all in a pot and be done with it? Yum!!! What a splendid idea! This is going on my menu for next week. Thanks so much. I love your blog! Wow, thank you Karen! I am so happy to hear that – ALL of it! :) Thanks again! 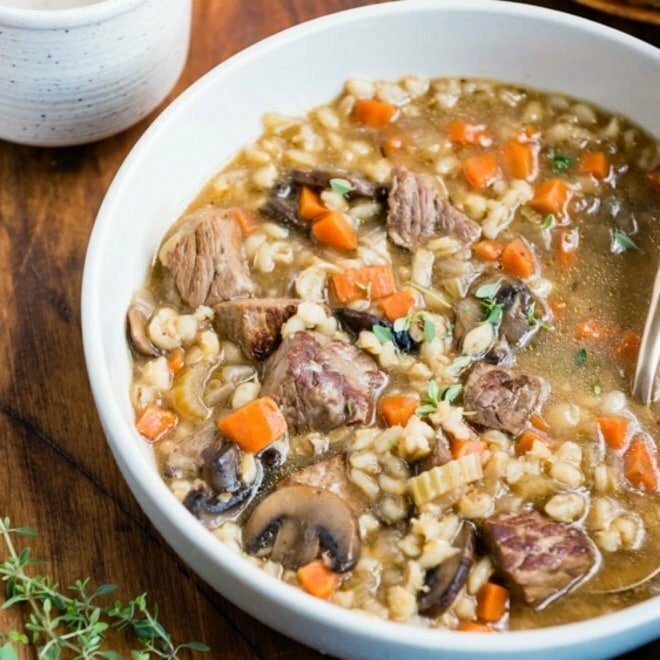 I’m all about slow cooker recipes this time of year! 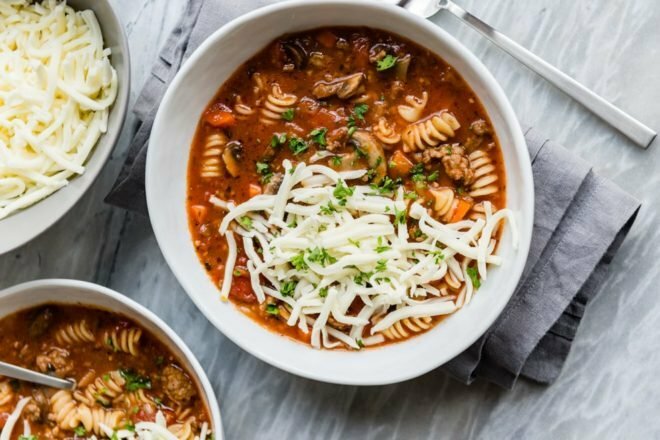 I’ve never had lasagna soup but it sounds like incredible comfort food! Pinned, of course. This veers into genius territory. Cakespy, you are too kind. Great dish! It was a big hit with the whole family (including our 10 month old)….they’ve already asked for it again next week. We’re not sure what Christmas will be like this year with Steph’s work schedule, but I’m trying hard to get us to Wisco for a white Christmas! Hi Kevin, thank YOU for stopping by! It’s always so refreshing when the weather cools down in SoCal and we can pretend we have a season other than summer…. ha! 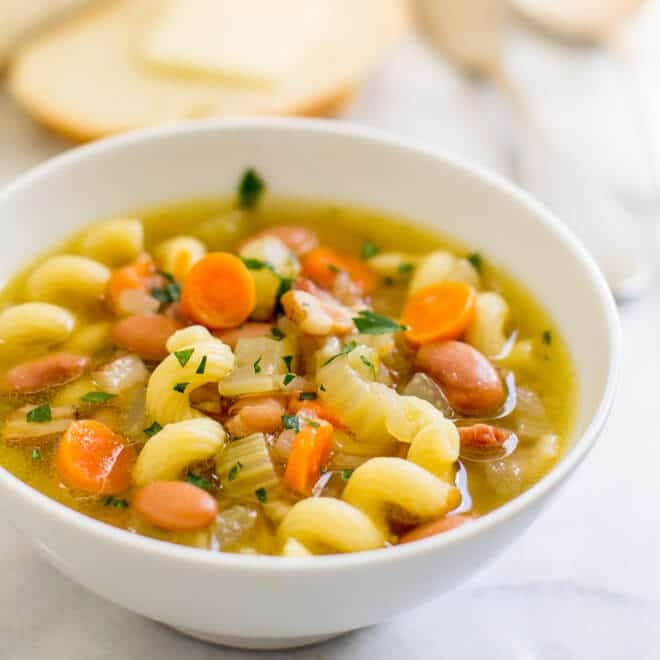 Does the pasta cook in the soup or should it be precooked before adding? Hi Carol, sorry this isn’t more clear. The pasta goes into the soup dry. Depending on your pasta choice, it will take around 10 – 15 minutes to cook through. Thanks for your question! A huge batch of this is simmering on the stove as I type! So excited to try it! The recipe calls for two cans of water… is that equivalent to two cups? I don’t know how much water to use lol. Worst measurement ever: Cans. Sorry. I am going to be fixing all my recipes so they don’t EVER say cans again. That’s just awful. A can is about 14 or 15 ounces, so 2 cans is just shy of 4 cups. Call it 3 1/2 cups. Sorry about that. Making it AGAIN for a cold/snowy/rainy night here in Atlanta. Perfect dish for everyone. A little southern twist serving it with corn bread…. Hooray Shineka! I am so happy to hear that! I love it too. I can’t wait to make it again. Do you know how many servings this recipe holds? Thanks! Is there a good substitute for fennel seeds you might recommend? I never buy them and I hate to just for one recipe…..thanks! Hi Amanda! Just leave them out. I can’t say I use fennel seeds for much either, pretty much just this, my regular lasagna, and my meat sauce. They just boost the “sausage” flavor but the soup is still great without them! Thanks. If I can help with anything else, please let me know! Amanda, I buy fennel seed in the bulk section. Grab a tiny bag and just buy several teaspoons. Can you use ground turkey in this recipe instead? You sure can! Just do a 1-for-1 swap. Great idea, I love ground turkey too! Made this soup for dinner last week on Thursday which is a busy day for me at work, it was delicious my boys loved it too. From now on it would be one of my slow cooker recipes to count on. Thank you for sharing it with all of us. What size slow cooker did this go into? I have a 6 1/2 quart slow cooker. However, there was a lot of room left at the top (not sure if you can see it in the overhead shot). I’d say a 5-quart slow cooker would work, possibly even smaller but I’m not sure. What do you mean by Italian Seasoning? Are you talking Oregano since Basil, onion, salt, pepper and garlic are already on the ingredients list? Hi Cece, there is actually a specific “Italian Seasoning” blend that you can buy at the store, it’s maybe $.99 at Walmart for example. Depending on the brand, it may contain basil, oregano, marjoram, thyme, sage, and rosemary. I apologize for the confusion and I’ll figure out what is in my own “Italian seasoning” so I can just list it out. But, having the blend on hand is convenient for things like this (but not earth-shattering in any way). It’s basically just dried herbs and does not usually contain salt, pepper, garlic, or onion. I hope that helps. Thank you so much, Kristi! And great ideas. Well I shy away from spicy food because I know my mom would never eat it, but I would love to try it for myself and update the recipe. So glad you liked it though! I need to make this again, soon! my fav pasta for mac and cheese is pipettes…its a happy marriage of macaroni and shells. i tried your recipe with cheese tortelini plus rotini….it was soooo lazagna good. i thought next time maybe ill try raviolis in it! The Lasagna Soup was delicious, but I’m still trying to figure out why this is called Lasagna Soup. Nevertheless, it was very tasty. Fair point. 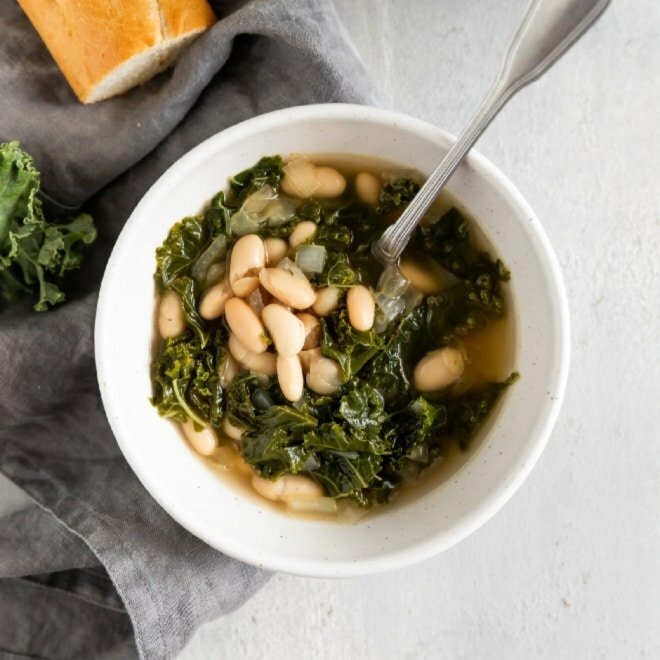 :) It’s basically the flavors of lasagna but in a soup form. I couldn’t find the small lasagna noodles at the time (radiatorre) and some of my pictures have no cheese. So basically the post just needs a little love and it will make more sense! Made it again. Re-post this bad boy. Too good to have this low in your feed! Miss you! #1 – 1 can of tomato sauce is 8oz – NOT 15oz. (especially at whole foods). I had to run to the store in the middle of making this recipe – you need to edit that. Hi Jane, I agree my search is terrible. I’m working on a redesign and that’s a top priority. I’m so sorry about that. I have a lot of ingredients tagged so I personally use the recipe index and look at the ingredients there. But I agree. Regarding tomato sauce – It comes in 8 ounce and 15 ounce cans. I can change the recipe and I wasn’t trying to mislead you, but my cupboard is full of 15-ounce cans of tomato sauce. I buy it Ralphs, Sprouts, and Walmart. I do shop at Whole Foods but I don’t buy canned goods there, so I can’t say. But I will for sure edit the recipe. Sorry about that!